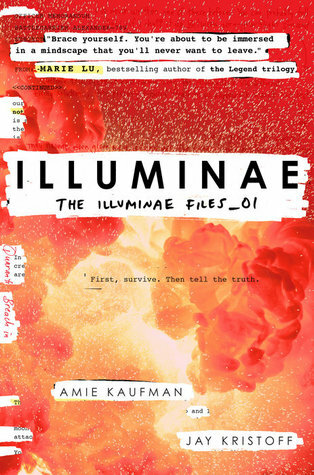 Presenting The Illuminae Files #1 Illuminae by Amie Kaufman & Jay Kristoff. Amie Kaufaman and Jay Kristoff. Those name alone warrant a buy. Kaufman's Starbound series (with Megan Spooner) and Kristoff's Lotus War books are just simply brillaint. The narrative is wholly in Epistolary format - Letters, IMs, emails and official reports and found transcripts. Its a war between the mega-corporations over a planet. Stunning and graphic world building. Like its happening right infront of us and we are a part of it. Its a high speed chase across the silent universe and the love story of Kady and Ezra desperately fighting for survival across two different space vessels. The style of presentation also scores pints in the pursuit of buying the tome. Kady is a genius hacker. She is antisocial. Doesn't work well with groups. Fierce, spunky and a spitfire are some of the points to describe her. Ezra was a sweetheart. Cocky, self-confident, athletic and very very goofy he may be but he also carries a big secret that brings him down. But points to him, he is resilient. Even if he and Kady aren't talking at the beginning and they are on two different evacuation ships, he would keep trying to reconnect with her. Nothing like world destruction to get your priorities straight and keep your near and dear ones closer. Both Kady and Ezra show such tremendous character growth as the page keep turning. Sentient AI gone crazy. "Am I Not Merciful"
A killer contaminant turning people into mindless zombies. Ax-ing them off one by one. The ticking countdown of the approaching enemy vessel, Lincoln. The military as always trying yo keep a lid on things. In the misguided attempt to keep the peace. Heartbreaking and heart-stopping twists and turns that keep us on the edge of our seats. As we sift through the pages at the speed of light. The raw data more than enough highlighting their dire circumstances. And that perfect ..... perfect finale that sets things in motion for the sequel. Its quite big in size. Really not much of a con if you think about how the narrative is styled. Come to think I didn't really find a single things bad about this book. "Engrossing. Immersive. Action paced. Heart Pounding"
I loved Illuminae! This book is so different, so unique, and so engrossing. I was worried about not getting into the story because of how it is told. BUT, it was wonderful! I can't wait to read Gemina.